In this c1960 aerial photo of Lowell Road and Central Street there are no signs of the traffic or of the traffic lights of today. Central Street runs horizontally along the middle of the photo with Lowell Road coming down towards the right. Just above this intersection is Hurley Street which appears as an unpaved road. 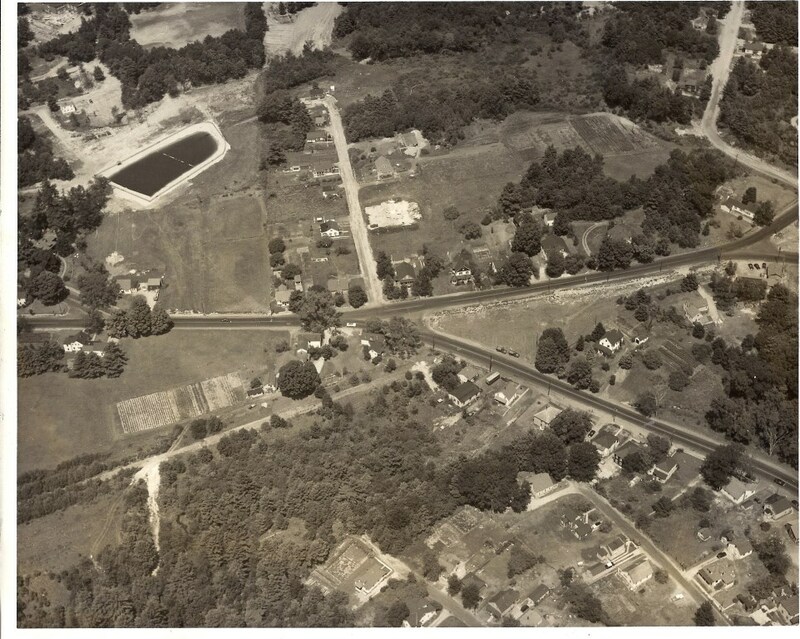 In the upper left is the Lions Club Community swimming pool between Library and Hurley Streets. This pool operated between 1954 and 1968, at which time increased operating costs required it be closed. The overpass for the B&M Railroad right of way crossed Lowell Road and proceeded along Central Street towards Hudson Center. The tracks and metal connected with this overpass were removed for scrap metal in 1942; but, the abutments on either side of Lowell Road remained into the 1950’s. By the time of this photo, these abutments had also been removed. The triangular piece of land at the intersection of Central and Lowell is now Hammond Park, The Fire Department Memorial. It is interesting to see the open space around many of the homes with their family or community gardens. I would like to hear from any of our readers who can add to the detail to help date this photo. Leave a comment or send email to HudsonHistorical@live.com. Photo was donated to the society bythe family of Leon and Gerri Hammond. By Ruth M Parker in Lowell Road on March 12, 2015 .